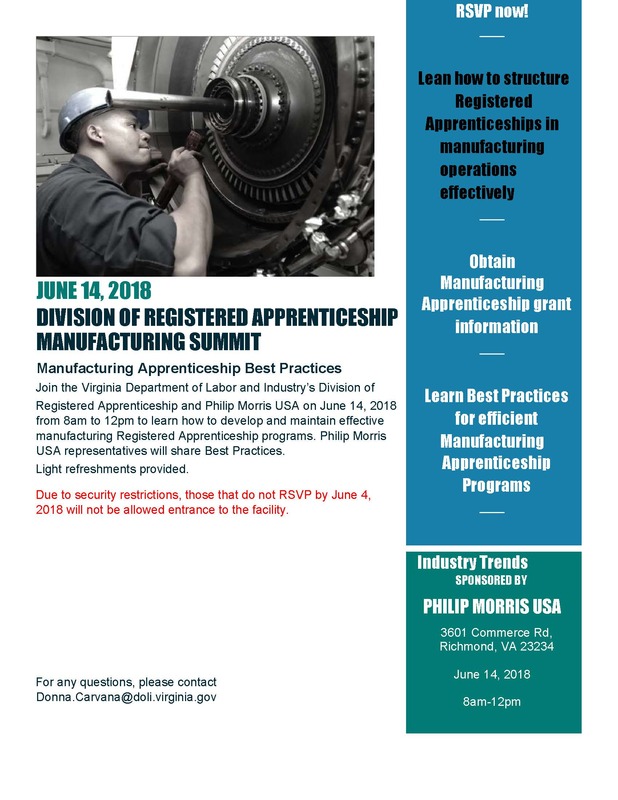 The Virginia Division of Registered Apprenticeship would like to share with you information regarding our upcoming Manufacturing Summit hosted by Philip Morris USA on June 14th, 8:00 am – 12:00 noon. The event will be held at 3601 Commerce Road, Richmond, VA 23234. The event is free with a light lunch provided. Representatives from Philip Morris USA will share information regarding how to develop and maintain effective manufacturing Registered Apprenticeship programs. They will discuss best practices from their experience as a sponsor company in the Virginia Registered Apprenticeship program. Due to security protocols at Philip Morris’s Commerce Road plant, all attendees must RSVP and register to attend. If you would like to attend, please email donna.carvana@doli.virginia.gov to receive an email invitation. If you know of manufacturing companies that might benefit from this summit, please share this information and send their email address to donna.carvana@doli.virginia.gov for invites to be emailed. This is a first come first serve registration. Please respond with your request for invitation as soon as possible todonna.carvana@doli.virginia.gov. Copyright © 2018 Orange County Economic Development, All rights reserved. You are receiving this email because we believe you will find it informative. You may opt out at your convenience.